The Arizona senator, who is retiring from Congress, is a frequent critic of President Donald Trump. 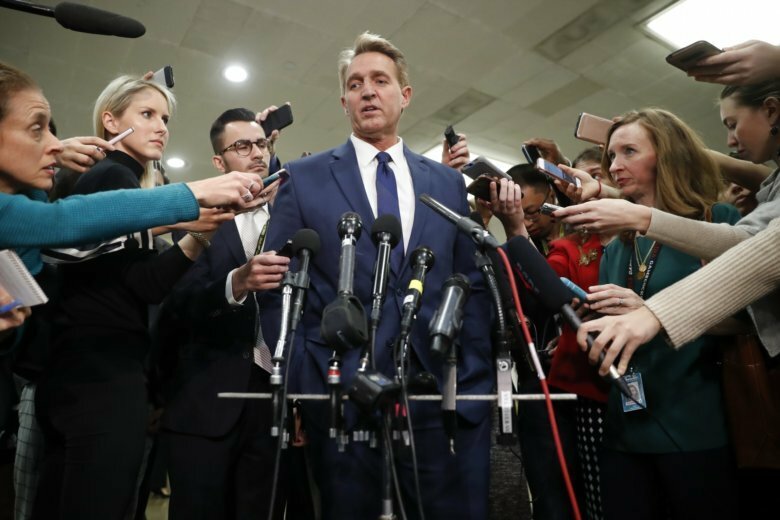 Flake has said he won’t vote for any federal judges until Senate Majority Leader Mitch McConnell holds a Senate floor vote on the special counsel bill. The Judiciary panel, with an 11-10 Republican majority, doesn’t have enough votes to advance nominees without Flake’s support. Confirming more judges before the end of the year is a top priority for McConnell, but he hasn’t budged in his opposition to the special counsel bill, which he says is unnecessary. On Tuesday, Texas Sen. John Cornyn, the No. 2 Republican in the Senate, said Republicans were counting how many votes they had on the special counsel bill — often a sign that legislation will be voted on soon. But McConnell said hours later that the bill is a “solution in search of a problem” because Trump is not going to act against Mueller. “We have a lot of things to do, to try to finish up this year without taking votes on things that are completely irrelevant to outcomes,” McConnell said. Flake made his pledge after Trump pushed out Attorney General Jeff Sessions earlier this month and temporarily replaced him with a loyalist, Matt Whitaker, who has criticized Mueller’s Russia investigation. Mueller is investigating Russian interference in the 2016 presidential election and Russian ties to Trump’s Republican campaign. Sessions, who worked on Trump’s campaign, had recused himself from overseeing Mueller— a decision that infuriated Trump and led to Sessions’ resignation.